For those not good with numbers, more than half failed the testing and that means unwitting registered guests of those hotels could have subjected themselves (and worse) their families to potentially unsafe swimming conditions and not have known it. Worse, yet? Sometimes the illnesses picked up from one spot (i.e. pool, spa, water park, etc.) do not manifest themselves until several days or a week later and unknowing infected swimmers frequent more than one pool… Need we say more? Regardless of your answer to that question, we will continue because not enough people concern themselves with healthy swimming practices — and that concerns us. Before joining our staff a member of our team contracted a rather unpleasant (and itchy!) skin condition after having a few too many poolside and beach-side cocktails after immersing himself in a hot tub that, in his own words, ‘did not look right’. About four days after the bumps, redness and itching started… and boy did he not enjoy several trips to the doctor as they tried different creams, antibiotics and anti-fungus medications in an effort to clear up the rash that had formed in both creases of his legs right where, as he phrased it, ‘the naughty bits began’. Does the hotel have staff that attend to the water features or do they contract out for pool care/maintenance? Do you see a posted log anywhere that tells you the last time anyone physically tested the water for vital water quality parameters such as bromine, free, chlorine, pH, total alkalinity, etc.? What first impression did you have of the swimming/bathing facility? If ‘not so great’ then perhaps you will find safer, albeit less interesting, relief from the heat in a lukewarm shower. Do you smell a LOT of chlorine in the swimming area. If so, then it may mean the water recently contained a large quantity of biological contaminants… and either it got shocked recently or you smell the off gassing of chloramines generated by the neutralizing of a large biological contaminant load — and health experts have rendered not-so-positive opinions about the aftereffects of inhaling large amounts of chloramines. How many swimmers do you see in the water? The more bathers in the water and the hotter the temperature outside, the greater the bather load and more biological contaminants (i.e. sweat and other stuff. OTHER stuff.) potentially in the water. Note the children, especially. Do we really need to explain this last bit one in greater detail? Adults, too, people. If you see adults drinking juice and sodas (aka: beers and mixed drinks) and they don’t, as folks in the military phrase it, ‘hit the head’ on a regular basis… you do the math. Sugars (and alcohol) tend to act as diuretics; meaning those who consume them will feel the need to urinate more frequently than normal. Again, no trips to the bathroom, that warm, yellowish liquid has to go someplace. While the above few tips will not guarantee you a safe and bacteria-free swimming experience when visiting a hotel and considering taking a dip in the pool or soaking in the hot tub, keeping them in the back of your mind surely won’t hurt. Can the average person test for bacteria in pool water? Yes. The WaterSafe Pool & Spa Bacteria Water Test Kit puts the power of on-the-spot pool/spa water testing for potentially harmful bacteria such as Pseudomonas, Aeromonas, E.coli, certain species of Salmonella, Shigella, Enterobacter, Klebsiella and a variety of other Coliform and non-Coliform bacteria into the hands of those who need it most: People unsure about the quality of water in an unfamiliar pool or spa. Planning a trip that may involve multiple stops and possibly multiple public pools? 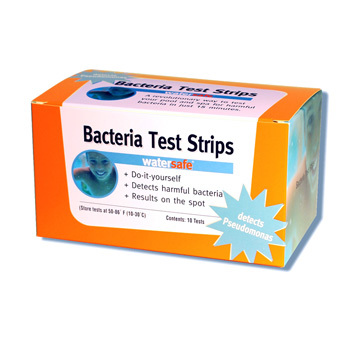 The WaterSafe Pool & Spa Bacteria in Water Test Kit contains 10 tests and each test takes less than 20 minutes to perform. In the time it takes to make sure the kids have adequate sunscreen on and have their arm floaties properly attached… you have the time required to make certain the water does not contain an unhealthy amount of potentially infectious and dangerous bacteria.